What was St Patrick’s diet like? “High in fibre, Omega-3 fatty acids, fermented milks, low GI grains, protein, minerals and vitamins, but low in sugars and meat. It is safe to say that obesity was not a problem in those days, and that the fare was seasonal, wholesome and modest by today’s standards,” says Sexton. 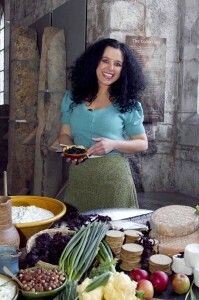 Items like soured milk drinks, oatmeal, seaweeds and wild fruits and vegetables were staples in the Irish early medieval diet, according to Sexton and they are also some of the foods recommended by contemporary nutritionists for optimal health. A wide range of wild foods, notably watercress and wild garlic, nature’s way of garnishing the delights of the countryside, was also on the menu, and if this didn’t whet his appetite, there were hen and goose eggs, honey, fish, butter, curds, seaweeds, apples and dairy as well. The rivers were flush with salmon, trout and eel, and hard-cured pork as well as other meats, were to be had too. Cereals, most commonly oats and barley, a little rye together with more prestigious and high-ranking wheat, were used in the production of flat breads and it is also likely that leavened wheat loaves were on offer. Various wet preparations such as porridge, gruel, meal pastes and pottages as well as cereal-milk and fruit-nut combinations were also being eaten on the island when the young Patrick arrived. “St Patrick would have consumed lots of fresh milk, sour milk, thickened milk, colostrum, curds, flavoured curd mixtures and soft cheese, particularly during the summer months with butter and hard cheeses saved for the leaner months of winter and spring,” she added.